DISCOUNT SUMMER Rate! FAMILY REUNIONS in Mountain Lodge! Big Savings over hotels!! Have your SUMMER FAMILY REUNIONS in our beautiful Colorado mountain home 'Tatanka Lodge" - nestled among tall old growth ponderosa pines on 35 private acres with a big wrap-around deck and views of the La Plata peaks. Just 10 mins. west from downtown Durango, 35mins. from Mesa Verde National Park and about 40 mins. from 'Purgatory' ski area. The main and upper floors are available for rental with private entrance from the deck. The home is artfully decorated in mostly Southwestern decor. Living room focal points are a floor-to-ceiling stone fireplace and a log sofa with water buffalo hide cushions. The dining room has an heirloom French Provincial dining set. Master bedroom/bath is on the main floor with kitchen, dining room, and living room; two big bedrooms upstairs with full bath and walk-in closets. Total beds: 2 Queens, 1 King, 1 Bunk so it sleeps up to 8 with extra floor mats available for kids. There is wall-to-wall carpeting throughout the house, dishwasher, W/D, TV/DVD, plentiful bed, bath linens & kitchenware. Also BBQ grill and picnic set on the deck. Relax on the deck to view the stars, the surrounding hills and La Plata peaks. Take an after dinner walk down the hill to a sweet little meadow and easy trails. For more vigorous adventures hike the miles of mountain trails in national forest lands, go for a horse ride at one of the stables, raft or fish the Animas River, ski Durango Mountain Resort (Purgatory), take the Narrow Gauge Railway to Silverton or stroll down Main St. with its art galleries, clothing stores and various ethnic restaurants. Whether you take it slow or ride 'em cowboy there's always something to delight you in Durango. * A ground floor apartment (with it's own entrance thru the garage) is occupied by quiet year round tenants with a dog. Guests occupy the main 2 floors of the lodge with the main entry and wrap-around deck. * NO SMOKING: SECURITY DEPOSIT FORFEITED IF SMELL OF SMOKE IN LODGE OR BUTTS FOUND on property. I'm a enthusiastic transplant from MA. Born and raised in Rutherford, NJ just across from "the City", spent 30 yrs in MA happily living in Lexington and Plum Island, Newburyport in a beach house but the wild beauty of the Rocky Mtns of Colorado always called to me and I finally found my dream home here in Durango. Went to college @ Seton Hall University and Boston College. I'm happy to share my home when I'm OOT visiting family with guests who appreciate and love the mountains as I do. This is the perfect lodge for family reunions (sleeps 8) or quiet couple/family vacations. 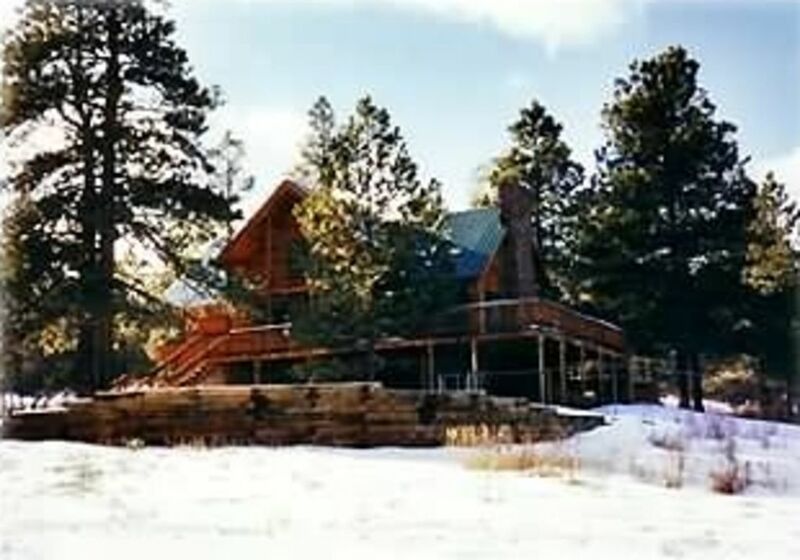 You have the beauty of the LaPlata vistas, whispering breezes through ponderosa pines, birds singing, an occasional deer or coyote wandering through the yard. Yet only 10 mins. from downtown Durango allows an easy trip for groceries, restaurants, movies, fishing or shopping. Trash Service, bird feeders, Ceiling Fans in the kitchen, dining room, and master bedroom, at our elevation of 7500 feet Air Conditioning is NOT necessary, * NO SMOKING! Overall we did enjoy having the privacy in your home. We were saddened because of flight cancelations we were not able to start enjoying until Sunday. Horseback Riding or Pack Trips, Hot Springs, Jeep Tours, Four Wheeling, Scenic Drives, Durango-Silverton Narrow Gauge Railway, Animas River Kayaking or River Tubing, MESA VERDE NATIONAL PARK. Guests occupy the main part of lodge: 1st & 2nd floor. Ground floor apartment occupied by quiet year round tenants.